The year 2015 rang in HSBC Colombo Fashion Week (CFW) for the 12th consecutive and successful year. Each year I find that the CFW team has brought in diversity in terms of the entire look and activities related to the event and also the designers. It is no easy feat to organise and pull together an event of such calibre but they do it with oomph and the right amount of determination. Each year the team is even more committed to raising the bar of fashion and fashion designing in Sri Lanka. This year was however also very much focussed on marketing the local designers’ brands and labels and also getting them retail ready. CFW took place over the past week and in conjunction to its main events, also hosted Fashion + Food, the Design Trunk Show, multiple workshops, BrightSparks and also Music Designed. I find that there are less loopholes to the whole week of events as the years go on and this is definitely a good thing. The space and atmosphere was different this year and that is because the Hilton Colombo ballroom is currently under construction. 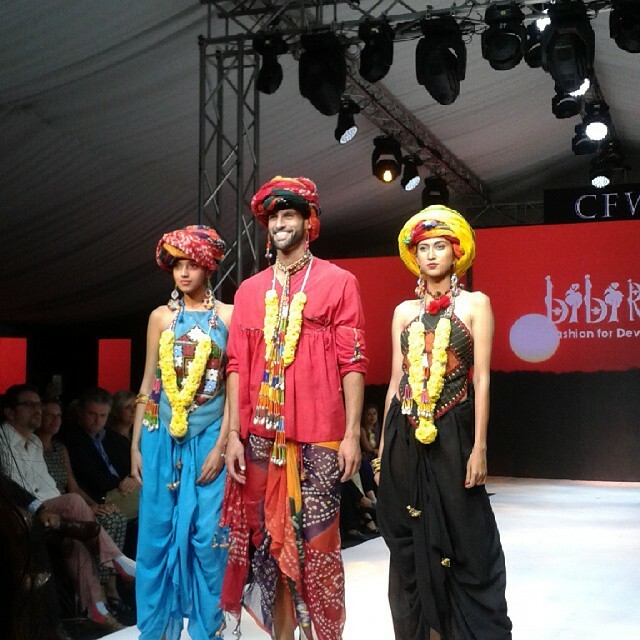 So CFW made do with the poolside that was transformed into a Fashion Village. An hour or two before the show you’d find Ajai Vir Singh (President and Founder of CFW) walking to and fro making sure everything looks the way he wants them to, Tasneem (who handled PR) making sure the seating arrangements and reserved seating is in order, Dino Corera (compeer) making corrections and notes on his list of what to say, the models looking impeccable walking around the poolside and Prasad Bidapa giving orders for them to be ready in time. The usual delay in starting the events each night was to have been expected and also the rush in which invitees hurry in to grab a good seat. I always have a good laugh over this as ladies in their ‘socially best attire’ hustle to and fro trying to find the perfect angle in which the show can be viewed. I like to think that Day 1 was the best night of all three; not that they were not great but the first day really set the bar on high with a great selection of designers who showcased their work. The collection by Indeevari Yapa Abeywardena for her label INDI was based on the Silk Road folks. Traditional textiles were given an up do and transformed into modern and contemporary designs, outfits with embellishments and with a very vintage feel. Smocked mousseline, embroidered florals, heavily textured floral prints, lace, velvet trim finishes, embossed plisse and ribbon edges highlighted the girly and feminine silhouettes. Stefal by Peronie showcased for the first time this year and her collection introduced a new ancient craft technique incorporated into her designs. Being a mixed culture designer, her appreciation for rich artistry was very much apparent in her spring and summer collection which was of blues, reds and purples for the season. Deneth showcased her designs once again this year and I find that each year she brings something similar yet different to the runway. Her designs mostly consist of the cheeththa fabric and her collection for 2015 took after the Chinese dress as a base cut, highlighted by shades of pastel blue, pink and also black. Of all the young designers, Amilani Perera showcased great growth through her collection this year. Inspired by the five-claw Vietnamese dragon, which was a symbol used only by kings at the time, her women’s wear line consisted of both structured and fluid silhouettes , new fabric embellishing techniques and luxurious silks in gold and grey silver. Onto perfecting the little white dress, Ramona Pulle certainly pulled off both flattering and form-fitting outfits that are versatile for the everyday woman. Her line ‘Exalt’ brought in designs with artisanal detail, luxurious fabrics and pieces that flatter the female form in traditional black and white colours and a touch of bright yellow, blue, pink and green. Charini Suriyage has a love for what is both traditional and modern. Her collection for CFW 2015 therefore consisted of modern-esque pieces form and flowy silhouettes and minute laser cut detail that was exquisite. 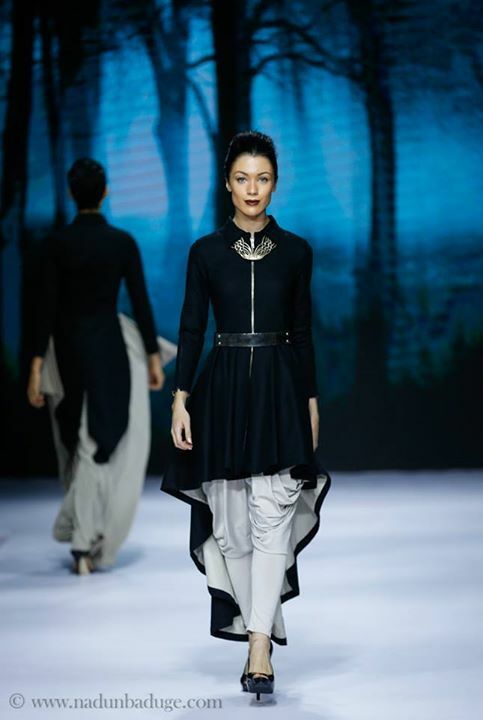 Straying away from his usual pastel and light hues, Dimuthu Sahabandu‘s collection was themed around “what brings us together pulls us apart” in dark shades of grey, black and a touch of white and mustard. Applying this universal concept in to his collection, garment fastenings were consisted in his designers. The collection also was a combination of his signature draping combined with structured tailoring. Completed the events of the first night was Radhika Hernandez‘s label Lois London. As a luxury kaftan line, her designs consisted of silk fabrics in bright and bold summery hues, draped into utterly feminine and timeless silhouettes. 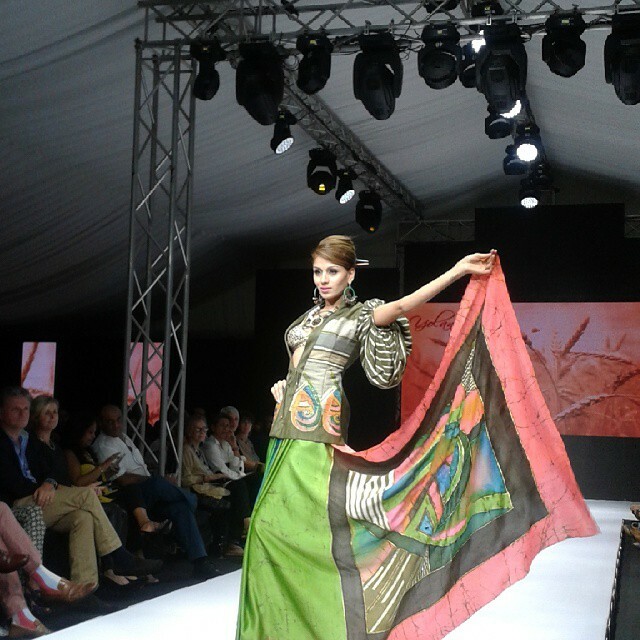 Kicking off the second day of CFW was Ramona Oshini with her collection ‘Stained’. Inspired by the stained glass designs from Dutch era churches and chapels, she gracefully managed to incorporate it all into her collection that featured vibrant colours, batik and the arashi shibori dye technique. Each piece therefore was timeless and dominated in shades of green, red, blue, black and gold. Another designer in whom I saw a great deal of growth was Yasisurie Kiribandara. Well focussed on creating pieces that were of the highest quality and well execution, black and white dominated her designs that dwelled into the inner peace of man. The symbol of peace was not overly used but gave some of her pieces an individualistic and serene look. She made use of silk satin fabric for her collection. Another newcomer to the CFW platform was Nelun Harasgama whose designer label ‘Ohe Island’ was a fresh and vibrant change to the second night’s showings. Her ocean inspired collection featured sarees, evening wear, pants and shirts, scarves, bags and shawls. Executed in batik and patchwork, her debut was certainly well received. Sonali Dharmawardena‘s label ‘Acushla’ closed the night with a stellar selection of evening wear, including exquisite sarees. Although she doesn’t call herself a designer, I find her clothing to be an epitome of what fashion is all about. As always, there are high expectations for the final night of CFW. The designer line-up seemed promising at the time. Opening the night’s events was Colombo Jewellery Stores, the ‘Unforgettable Collection’ by Akram Cassim. The collection reflects an understated sense of elegance and consisted of beautifully handcrafted earrings, bangles, bracelets and necklaces using amethysts, diamonds, emeralds, sapphires, rubies and citrines. Drawing inspiration as always from the magical East coast, Arugam Bay beachwear focussed on a more nautical and colour-block aspect of designs. The clean and fitted used of colour highlighted the laidback styles of this collection. For this year, the FH Studio collection by Fouzul Hameed revolved around the shades of blue. Overall, the collection included semi collection that were of casual linen, smart casual and ceremonial. The designer had made use of innovative laser and digital prints to give his collection a very diverse and unique look. All garments were made using the finest of fabrics and accessories, ensuring high quality and perfection. Upeksha Hager is no stranger to CFW but I also saw a great deal of growth in her collection as well this year. Her collection had a very rustic yet clean cup look. Her seamless attention to detail and finish as always has been a prominent feature of her work, and this year was no different. She took on the task of working with both light and pastel shades as well as dark toned hues to create a very unique collection for the runway. Bringing all three shows to an end was none other than Yoland Aluwihare. Dresses, sarees and evening wear with asymmetrical elements, exotic fabrics, splashes of colour and sophisticated modern shapes highlighted her collection that was heavy on muted tones and gradually moved on to striking summer shades. Of the handful international designers who also participated in CFW this year, Harare by Caroline Fuss and the collection by Lars Anderson certainly stood out. While Fuss’s collection consisted of woolly and thick fabrics crafted into modern and contemporary designs, Anderson’s collection featured scooped neck dresses, cropped shawls and long skirts made of the finest Japanese and Italian fabrics. Here are some of the highlights from Day 3! Stay tuned for the more detailed posts on the three days in the coming week!